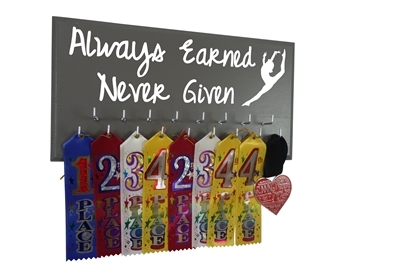 Commemorate that special feeling you had on race day with one of our highly customizable running medal display racks! Whether you're running a 5K or a marathon, nothing compares to the feeling of supporters cheering on the sidelines as you make your way to the finish line. We're familiar with that feeling ourselves, which is why we've chosen to offer this large selection of running medal and race bib displays. All displays are made of recycled MDF wood coated in a protective varnish. 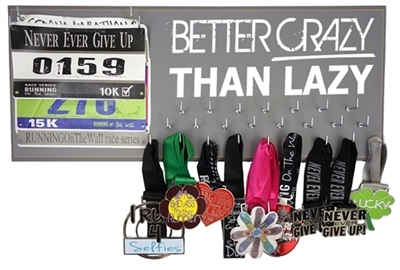 We give you the option to choose from a large selection of colors so that your marathon medal hanger will cater to whatever your design tastes. All running bib holders come with the option to choose whichever inspirational saying speaks to you, such as "I did it" and "In it for the long run," while sturdy hooks and the bib holders easily display your accomplishments. Running medal displays and race bib holders should reflect your personality and accomplishments without breaking the bank, which is why we've focused on customization and affordability. Shop with Running on the Wall today for max out shipping at $9.99 only on medal hangers!